Question 1. A force of 7 N acts on an object. The displacement is, say 8 m in the direction of the force. Let us take it that the force acts on the object through the displacement. What is the work done in this case ? Question 1. When do we say that work is done ? Answer. Whenever a force acting on an object, is able to move the object through some distance in its direction, a Work is said to be done . Question 2. Write the expression for the work done when a force is acting on an object in the direction of its displacement. Answer. 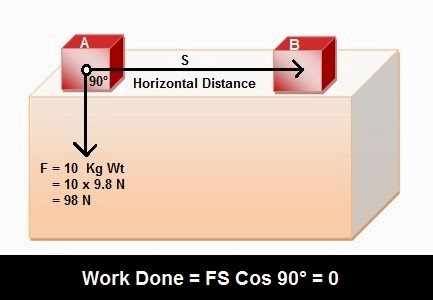 Work done on an object is defined as the magnitude of the force multiplied by the distance moved by the body in the direction of the applied force. Question 3. Define 1 J of work. Answer. Work done on a body is said to be 1 J (Joule) ; if a force of 1 N (Newton) acting on a body, displaces it by a distance of 1 m along the line of action of the force.. Question 4. A pair of bullocks exerts a force of 140 N on a plough. The field being ploughed is 15 m long. How much work is done in ploughing the length of the field ? Question 1. What is kinetic energy of an object ? Answer. kinetic energy of an object, is the energy possessed by an object on account of its motion. Its SI unit is joule. Example. Water falling down has K.E., due to which it can rotate the blades of a water turbine. Question 2. Write an expression for kinetic energy of an object. Question 3. The kinetic energy of an object of mass m, moving with a velocity of 5 ms–1 is 25 J. What will be its kinetic energy when its velocity is doubled ? What will be its kinetic energy when its velocity is increased to three times ? Question 1. What is power ? Answer. Power is defined as the rate of doing work or the rate of transfer of energy. It is scalar quantity. S.I. unit of power is watt. 1 W = 1 J/s. It is also measured in horsepower ( 1 HP = 746 watt). Question 2. Define 1 watt of power. Question 3. A lamp consumes 1000 J of electrical energy in 10 s. What is its power ? As given, here, Work 'W' = 1,000 J, time 't' = 10 s, Power 'P' = ? Question 4. Define average power. Answer. Over a period of time, power of an object keeps on varying. When an object or machine performs different amounts of work or consumes different amount of energy in different intervals of time, the ratio between the total work done or total energy consumed to the total time taken is called average power. Question 1. Look at the activities listed below. Reason out whether or not work is d one in the light of your understanding of the term ‘work’. (i) Suman is swimming in a pond. (ii) A donkey is carrying a load in its back. (iii) A wind mill is lifting water from a well. (iv) A green plant is carrying out photosynthesis. (v) An engine is pulling a train. (vi) Food grains are getting dried in the sun. (vii) A sail boat is moving due to wind energy. Answer. (i) Suman is swimming in a pond : Yes, Suman is doing work. By pushing water in backward direction, he is able to move in forward direction due to reactionary force offered by the water. Here, the work done is negative, as the displacement of Suman is in opposite direction . (iii) A wind mill is lifting water from a well : Yes, A wind mill is doing work in lifting water from a well, because the direction of displacement in terms of height as well as force are same. (iv) A green plant is carrying out photosynthesis : No, in the absence of an applied force and a resulting displacement, apparent ally no work is being done in this case. (v) An engine is pulling a train: Yes, an engine pulling a train is performing work as due to applied force by an engine, the displacement of train is taking place in the direction of applied force. (vi) Food grains are getting dried in the sun : No, physically work is done , when food grains are getting dried in the sun. But looking this process in different way, answer is yes. The heat energy from the Sun, converts a part of grains in the form of moisture into steam rising above thus changing the position of water contents hence P.E. (vii) A sail boat is moving due to wind energy : Yes, a sail boat is moving due to wind energy is example of work done as direction of applied force and displacement are the same . Question 2. An object thrown at a certain angle to the ground moves in a curved path and falls back to the ground. The initial and final points of the path of the object lie on the same horizontal line. What is the work done by the force of gravity on the object ? Therefor, the work done by the force of gravity on the object is Zero. Question 3. A battery lights a bulb. Describe the energy changes involved in the process. Answer. On connecting a lamp with battery, the chemical energy stored in the battery, is first converted into electric energy, which on passing through filament of lamp gets converted into heat energy and light energy. Question 4. Certain force acting on a 20 kg mass changes its velocity from 5 ms–1 to 2 ms–1. Calculate the work done by the force. Question 5. A mass of 10 kg is at a point A on a table. It is moved to a point B. If the line joining A and B is horizontal, what is the work done on the object by the gravitational force ? Explain your answer. As object is moved from point A to a point B, direction of its displacement AB is horizontal. The direction of gravitational force is vertically downwards or perpendicular to direction of displacement. Question 6. The potential energy of a freely falling object decreases progressively. Does this violate the law of conservation of energy? Why ? Answer. No. The law of conservation of energy is not violated as it states that the sum of the potential energy and kinetic energy of the object would be the same at all points.i.e. 'potential energy + kinetic energy = constant' The loss in potential energy results in an equal gain in kinetic energy of the object. Question 7. What are the various energy transformations that occur when you are riding a bicycle ? Answer. First through bio-chemical reaction, the chemical energy stored in the form of synthesized food product is converted into heat and increased muscular force. On paddling, the muscular force gets transformed into mechanical energy resulting in motion of bicycle. Question 8. Does the transfer of energy take place when you push a huge rock with all your might and fail to move it ? Where is the energy you spend going ? Answer. No, as there is no displacement of rock in the direction of applied force, so there is no energy transfer between the rock and our body because . The energy spend is being used up against the static inertia of the rock. Question 9. A certain household has consumed 250 units of energy during a month. How much energy is this in joule ? Question 10. An object of mass 40 kg is raised to a height of 5 m above the ground. What is its potential energy ? If the object is allowed to fall, find its kinetic energy when it is half-way down. Let its velocity be v.
Question 11. What is the work done by the force of gravity on a satellite moving round the earth ? Justify your answer. Question 12. Can there be displacement of any object in the absence of any external force ? Answer. Yes, there be displacement of any object in the absence of any external force. As per Newton's first law of motion, an object will remain in state of rest or motion in a straight line even in the absence of an external force . Question 13. A person holds bundle of hay over his head for 30 minutes and gets tired. Has he done some work or not ? Justify your answer. Answer. As on application of muscular force, there is no displacement of bundle of hay in the direction of applied force, so work done by him on hay is zero. However, in order to support the weight, the person has to do some work in straining the muscles, as they become loose on tiring. Question 14. An electric heater is rated 1,500 W. How much energy does it use in 10 hours ? Question 15. 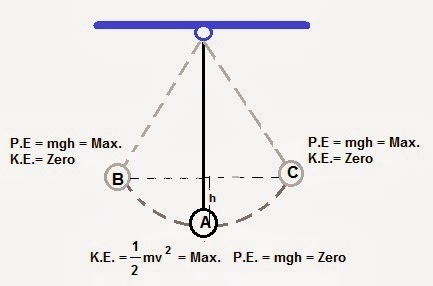 Illustrate the law of conservation of energy by discussing the energy changes which occur when we draw a pendulum bob to one side and allow it to oscillate. Why does the bob eventually come to rest? What happens to its energy eventually ? Is it a violation of the law of conservation of energy ? Answer. As per the law of conservation of energy, the sum of the potential energy and kinetic energy of the object would be the same at all points.i.e. 'potential energy + kinetic energy = constant' . When we draw a pendulum bob to one side and allow it to oscillate. Its P.E. at side point say 'B' is mgh and K.E. is zero. As it swing to far end at 'C' through mean point 'A' Its whole P.E. which is mgh at B, gets converted into K.E. on reaching A. And its P.E. i.e. mgh becomes zero. As the bob overshoots A and reaches C' due to this speed. Its energy at C' is partly kinetic and partly potential but the sum of K.E. and P.E. is the same as K.E. at A and P.E. at B. So, when it reaches C, its whole energy is P.E. Yes, the bob comes to rest after some time because of the resistance of the air to its motion and work done against friction at the point of oscillation O. No, it is not a violation of the law of conservation of energy. The energy initially possessed by the bob is mostly converted to heat energy due to resistance of air and friction (at point of support). Also, a small fraction of energy is also converted into sound energy. The law of conservation of energy is not at all violated as sum total of all the energies is constant. Question 16. An object of mass, m is moving with a constant velocity, v. How much work should be done on the object in order to bring the object to rest ? Thus, an equivalent amount of work should be done on the body in order to bring it to rest. Question 17. 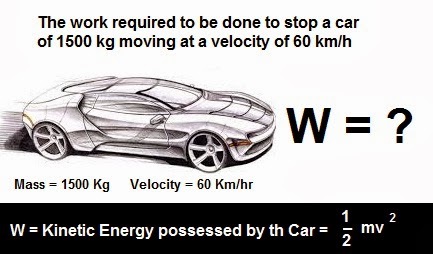 Calculate the work required to be done to stop a car of 1500 kg moving at a velocity of 60 km/h. Question 18. In each of the following a force F is acting on an object of mass m. The direction of displacement is from west to east shown by the lower arrow. Observe the diagrams carefully and state whether the work done by the force F is negative, positive or zero. Answer. (i) In the first case, the force is perpendicular to displacement. (ii) In the second case, F and s are in same direction. (iii) In the last case, as F and s are in opposite direction. Question 19. Soni says that the acceleration in an object could be zero even when several forces are acting on it. Do you agree with her ? Why? Answer. Yes, I agree with her because an object, being acted upon by multiple forces can be in a state of rest due to cross cancellation of forces. Thus, will have zero velocity. As there is no change in velocity, it will have zero acceleration. On the other hand, When the object is moving with a constant velocity, its acceleration is zero. Even in this situation, multiple forces may act on the object , balancing each other. Question 20. Find the energy in kWh consumed in 10 hours by four devices of power 500 W each. or E = 20 kWh. Question 21. A freely falling object eventually stops on reaching the ground. What happens to its kinetic energy ? Answer. When a freely falling object eventually stops on reaching the ground, its kinetic energy is converted to heat and sound energy. 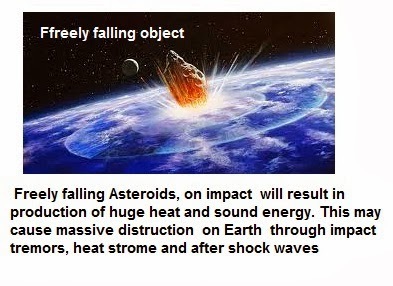 On the impact with ground, there may be some deformation or destruction at the point of impact, followed by a rise in temperature and production of some sound . Work done on an object is defined as the magnitude of the force multiplied by the distance moved by the body in the direction of the applied force. Work done against friction is an example of negative work. The unit of work is joule. Living beings as well as machines need energy to do work. Work done by an object is an indicator of the energy possessed by it. The law of conservation of energy states that energy can neither be created nor destroyed. It can only change its form. The two main forms of mechanical energy are kinetic energy and potential energy. The spring of a watch contains elastic potential energy. The energy possessed by a body by virtue of its position or configuration is called potential energy. Work done on a body by an external forces is equal to the change in kinetic energy of the body. For a body falling freely the sum of kinetic and potential energies at any moment of its fall remains constant. The rate of doing work is called power. It is measured in watt and also in horse power (1 H.P. = 746 W). Power is given by P = W / t, where ‘W’ is the work done or energy consumed and ‘t’ is the time taken.